One of my daughter's favorite books this week is Snowmen at Christmas by Caralyn Buehner and illustrated by her husband, Mark Buehner. 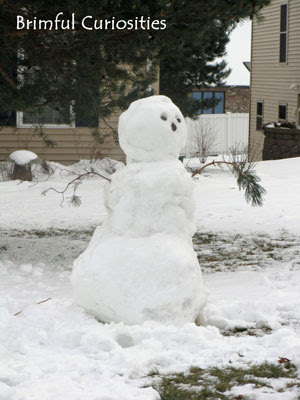 A boy builds a snowman on Christmas Eve and wonders how snowmen celebrate Christmas. He decides that they must slip away at night and celebrate while he is sleeping. In rhyming verse the book tells all about the jolly snowmen that gather together on Christmas Eve in the center of the town. They trim trees, serve cold treats, dance and wait for the arrival of Kris Kringle. The spectacular, blueish hued illustrations show the snowmen taking part in all the magical festivities. The illustrator has also added a really neat touch to each page spread. My daughter loves searching for a cat, a rabbit, a Santa face, a Tyrannosaurus Rex, and a little brown mouse hidden in each painting. They aren't easy to find! In the last page we found even more hidden images, like a star, stocking and deer. One of the pages reminds me of the Whos of Whoville and depicts the snowmen holding hands and singing songs about "snow, and the birth of a King." We didn't make many crafts indoors this week, but instead went outside and built our own snowman. Hopefully he won't melt and will still be around next week on Christmas Eve to celebrate with his friends in the center of our town. 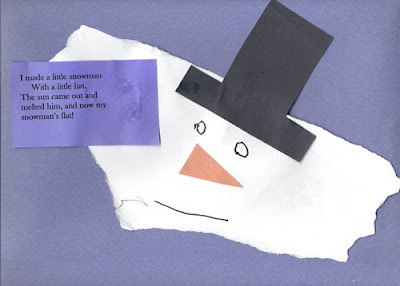 As far as crafts go, I'm also including a picture of one of my daughter's preschool projects from last year, a cute melted snowman with the accompanying verse, "I made a little snowman with a little hat. The sun came out and melted him, and now my snowman's flat!" For more winter themed picture books, check out this wonderful Wintry Tales list at Scholastic. Kansas City, Kansas Public Library also has a nice Snowman Booklist. A Mommy's Adventures has posted a neat picture of her Snowman Felt Board. Looks like a ton of fun for kids to play with, especially if they can't get outdoors to build their own. Post what you've been reading each week with your kids at The Well-Read Child or Mouse Grows, Mouse Learns. A Mommy's Adventures hosts the "stART" meme (Story + Art) each week. Hope Is the Word hosts a Read Aloud Thursday link-up as well. I am an Amazon affiliate and may receive a very small commission for products purchased through my Amazon links. I love books with pictures that reward careful searching. This one sounds good. The real (and melted) snowman are awesome! Making a real snowman is so much better than a craft one! Lucky you for having real snow!! We checked this book out from the library this week and really enjoyed it. I love the fact you were able to get out side and build a real snowman, now that is great art! Sounds like a cute book. My daughter loves all things snowman right now, I can't wait until we get some more snow and can get outside and build our own. Yours looks great. :) Happy Holidays! Love LOVE LOVE your snowman! We rarely get enough snow here to make even a one foot tall one, so this would be a real treat for us. Love the craft, too. Thanks for linking up Read ALoud Thursday! How neat it is that you could build your own snowman as a story stretcher! We have this book from the library, but we haven't read it yet. Anna listened to Snowmen at Night during the last story time in the library, so I am pretty sure this one will be a hit as well.